The portable USB-C to 10/100 Ethernet Adapter with 3 Super Speed USB 3.0 Ports. It can connects a laptop or desktop computer with USB-C or Thunderbolt 3 to a router or switch to allow a fast network connection. Connect to the internet instantly using any USB-C device, and enjoy stable connection high speeds. All wrapped in a premium, durable. Connect any USB-C web device to the Internet via an Ethernet port. The minimalist style, premium aluminum exterior and feel is the perfect complement to your workspace. Full speed usb 3.0 port allows you to connect your mouse, keyboard, hardrive, U flash drive, etc. Speed up to 5Gbps. Down compatible with usb 2.0 devices. Simply plug the adapter into the USB-C port of your computer. No external software drivers are required. USB bus-powered adapter requires no external power adapter. This USB Ethernet network adapter is the ideal laptop network adapter and perfect travel accessory. It's incredibly compact and lightweight for carrying in your laptop bag. USB Type C Adapter compatible with for MacBook, Nexus 6p/5x laptop, mobile phone or other USB-C ports devices. If you not sure the compatibility of your devices, or any other questions about the quality, please feel free to contact us. RSHTCH Team with own factory, we are committed to providing each customer with better products. USB-C Compatible: The USB-C Ethernet adapter works with the latest computers and smart devices with USB-C Adapter 3-Port. Connect your computer to superfast ethernet network, provide a RJ-45 connector that support 10/100 BASE-T performance. 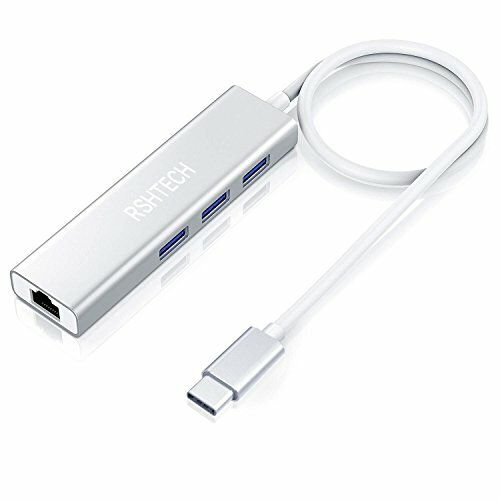 Fast and Safety: Simply plug the USB-C Ethernet adapter into the USB-C port of your computer. Wired connections provide faster data transfers and better security than Wi-Fi. It helps you to enjoy the wired stable network gigabit ethernet again and make your work more effectively. Fashionable & Slim: Ultra compact aluminum design goes perfectly with the new MacBook and many other devices.Sleek yet durable, Amazingly simple, delicate, small and handy. Easy to Use: No CD or external software drivers are required and the USB-C 3-Port to Ethernet adapter does not require an external power adapter. Package: USB-C Gigabit Ethernet Adapter ( 3-Port Data Hub ). No driver software required, allows simple set up, plug and play. If you have any questions about this product by RSHTECH, contact us by completing and submitting the form below. If you are looking for a specif part number, please include it with your message.